11 But Moses tried to pacify the Lord his God. “O Lord!” he said. “Why are you so angry with your own people whom you brought from the land of Egypt with such great power and such a strong hand? 12 Why let the Egyptians say, ‘Their God rescued them with the evil intention of slaughtering them in the mountains and wiping them from the face of the earth’? Turn away from your fierce anger. Change your mind about this terrible disaster you have threatened against your people! 15 Then Moses turned and went down the mountain. He held in his hands the two stone tablets inscribed with the terms of the covenant. They were inscribed on both sides, front and back. 16 These tablets were God’s work; the words on them were written by God himself. 19 When they came near the camp, Moses saw the calf and the dancing, and he burned with anger. He threw the stone tablets to the ground, smashing them at the foot of the mountain. 20 He took the calf they had made and burned it. Then he ground it into powder, threw it into the water, and forced the people to drink it. 21 Finally, he turned to Aaron and demanded, “What did these people do to you to make you bring such terrible sin upon them?” 22 “Don’t get so upset, my lord,” Aaron replied. “You yourself know how evil these people are. Hebrew, Israel. The names “Jacob” & “Israel” are often interchangeable throughout the Old Testament, referring sometimes to the individual patriarch & sometimes to the nation. Hebrew, the 2 tablets of the Testimony; see note on 25:16. Hebrew, Place inside the Ark the Testimony; similarly in 25:21. The Hebrew word for “Testimony” refers to the terms of the Lord’s covenant with Israel as written on stone tablets, & also to the covenant itself. Indeterminate – day time, morning (sun rises from the left) long shadows make it early morning. Moses (holding 2 stone tablets), Aaron (hiding behind rock near path that goes up to the summit of mt. Sinai, various revelers & dancers, musicians, etc. Google earth position & orientation – 28 deg 33’ 08.39” N 33 deg 58’ 42.44” E Looking due S. The summit of mt. Sinai has a google earth yellow placement marker on it! Although I used this view from google earth as the basis of this cartoon (with an identical background), the foreground has been changed to show a close up of the mountain rocks & a path that goes off towards the summit of mt. Sinai. I looked up the Hebrew text for the 10 commandments & have managed to write all of the first 2 on the top stone tablet, in Hebrew! I research Hebrew dancing on the internet & found examples of several people engaged in it: used those images to help me to draw the dancing figures in my cartoon. This is the first time I have attemted to draw gold. Use of contrasting light & dark yellow, orange, brown shades are effective. Highlight in white makes the gold look shiny. 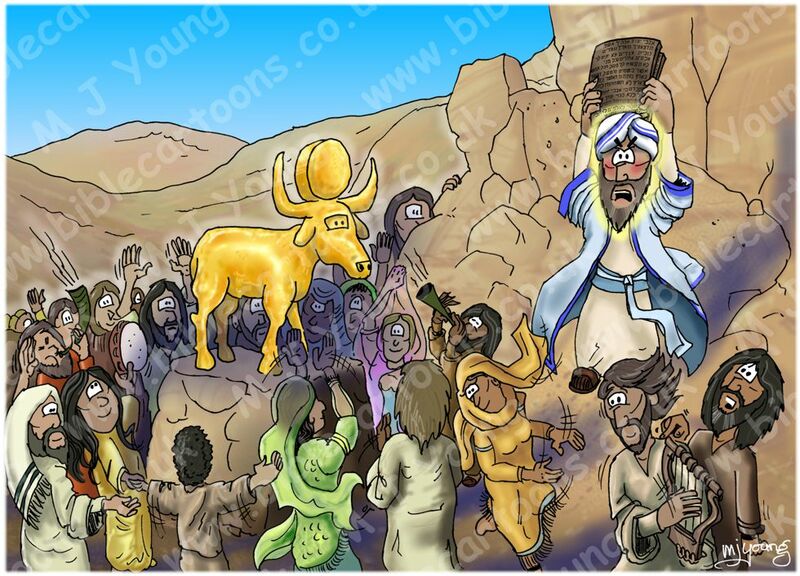 This is the first cartoon that i have drawn that has Moses in it. I am also currently colouring the Transfiguration, from Luke 9. 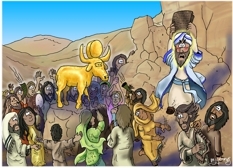 The 3rd scene has Moses in it, so the colouration I have created in the Golden calf can be directly applied to that scene as well.